Nazaré (Portuguese pronunciation: [nɐzɐˈɾɛ]) is a Portuguese municipality in Oeste region and Leiria District, in historical Estremadura province of Portugal. It is one of the most popular seaside resorts in the Silver Coast (Costa da Prata), Portugal. The population in 2011 was 15,158, in an area of 82.43 km². The present mayor is Walter Chicharro, elected by the Socialist Party (Portugal). The municipal holiday is September 8 with the Feasts of Nazaré, a religious and profane festival with processions, bullfights, fireworks, folk dancing and a fair. The town consists of three neighbourhoods: Praia (along the beach), Sítio (an old village, on top of a cliff) and Pederneira (another old village, on a hilltop). Praia and Sítio are linked by the Nazaré Funicular, a funicular railway. The origin of the name Nazaré comes from the Portuguese translation of the biblical city name of Nazareth in Holy Land. The Sanctuary of Our Lady of Nazaré. The earliest settlements were in Pederneira and in Sítio, above the beach. They provided the inhabitants with refuge against raids by Viking, later French, English and Dutch pirates, that lasted until as late as the beginning of the 19th century. In fact, only in the 19th century, with the gradual end of maritime piracy, was possible for the people to start occupying the Praia which is today considered the town center. According to the Legend of Nazaré, the town derives its name from a small wooden statue of the Virgin Mary, a Black Madonna, brought by a monk in the 4th century from Nazareth, Holy Land, to a monastery near the city of Mérida, Spain. The statue was brought to its current place in 711 by another monk, Romano, accompanied by Roderic, the last Visigoth king of today's Portugal. After their arrival at the seaside they decided to become hermits. The monk lived and died in a small natural grotto, on top of a cliff above the sea. After his death and according to the monk's wishes, the king buried him in the grotto. Roderic left the statue of the Black Madonna in the grotto on an altar. 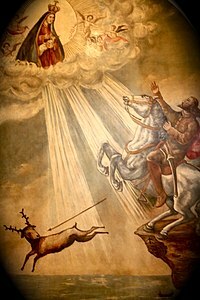 The first church in Sítio was built over the grotto to commemorate a miraculous intervention in 1182 by the Blessed Virgin Mary, which saved the life of the 12th-century Portuguese knight Dom Fuas Roupinho (possibly a templar) while he was hunting deer one morning in a dense fog. This episode is usually referred to as the Legend of Nazaré. In memory of the miracle he had a chapel (Capela da Memória) built over the small grotto, where the miraculous statue had been left by king Roderic after the monk's death. Beside the chapel, on a rocky outcrop 110 meters above the Atlantic, one can still see the mark made in the rock by one of the hooves of Dom Fuas' horse. This Church of Nazareth, high on the rocky outcrop over Pederneira bay, was noted as a landmark in sailors' manuals. In 1377, King Fernando I of Portugal founded a new more spacious church which was totally transformed between the 16th and 19th centuries. The Sanctuary of Our Lady of Nazaré is a rich baroque building, with splendid tiles on its interior. Behind and above the main altar visitors can see and venerate the miraculous statue of Our Lady of Nazaré. The religious figures are crowned by diadems of 18th century, presented to the church by King John VI. The sacred image is wrapped with a green cloak decorated with gold gifted to the Virgin Mary by King John V. The main chapel is separated from the body of the church with an arcade made from pau-santo and a few pillars decorated with mosaic Italian marble of 19th century. Nazaré has become a popular tourist attraction, advertising itself internationally as a picturesque seaside village. Located on the Atlantic coast, it has long sandy beaches (considered by some to be among the best beaches in Portugal), with lots of tourists in the summer. The town used to be known for its traditional costumes worn by the fishermen and their wives who wore a traditional headscarf and embroidered aprons over seven flannel skirts in different colours. These dresses can still occasionally be seen. 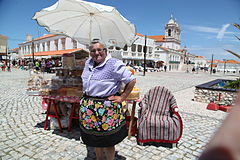 A woman from Nazaré wearing the traditional seven coloured flannel skirts. It is quite visited due to the religious festivals dedicated to Our Lady of Nazaré, in which there are processions and also some profane celebrations. Many of the tourists and also the Catholic pilgrims who visit the region of Central Portugal and especially the internationally famous Sanctuary of Our Lady of Fátima (located nearby, in Cova da Iria, Fátima) often go to the fishing village of Nazaré for a visit or to watch the surfing championships. Tow-in surfing in Nazaré, Portugal. Giant breaking waves in Praia do Norte. The Praia do Norte, Nazaré (North Beach) was listed on the Guinness World Records for the biggest waves ever surfed (formed under the influence of the Nazaré Canyon). Nazaré is a popular surfing destination because of its very high breaking waves that form due to the presence of the underwater Nazaré Canyon. As the canyon creates constructive interference between the incoming swell waves, it makes their heights much larger on this stretch of coast. Due to the height of the waves, numerous surfing records have been set at Nazaré. In November 2011, surfer Garrett McNamara, who resided in Hawaii at that time, surfed a then record-breaking giant wave: 23.8 m (78 ft) from trough to crest, at Praia do Norte, Nazaré. On November 8, 2017, Brazilian surfer Rodrigo Koxa broke the previous record by surfing a big wave of 24.4 m (80 ft); for this feat he won the Quiksilver XXL Biggest Wave prize and entered the Guinness World Record for the biggest wave ever surfed. Social media wrongly attributed a footage of German surfer Sebastian Steudtne surfing another big wave also in Nazaré to Koxa; both have made public statements in attempts to correct the original misinformation. 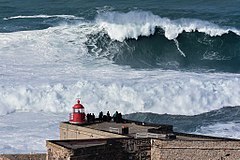 In the meantime, Portuguese surfer Hugo Vau surfed a potentially 35 m (115 ft) high wave, known as "the big mama", on 19 January 2018. This achievement yet to be validated. The waves at this point can also be dangerous to those ashore. In August 2012, a rogue wave killed a 5 year old British girl and her grandfather walking along Salgado Beach. ^ "NAZARE TOURISM GUIDE, Portugal's most picturesque fishing village". golisbon.com. ^ Sailing Directions for the West Coasts of France, Spain and Portugal. United Kingdom Hydrographic Office. 1891. p. 348. ^ Murray, John (1856). A handbook for travellers in Portugal ... J. Murray. p. 88. ^ Diário da República. "Law nr. 11-A/2013, page 552 80" (pdf) (in Portuguese). Retrieved 29 July 2014. ^ "Museums in Nazaré". www.portugaltravel.org. Retrieved 2017-09-09. 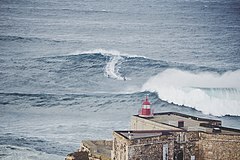 ^ "Hawaiian surfer breaks wave-riding record at Nazare, Portugal". BBC News. 2012-05-11. Retrieved 2012-08-22. ^ "McNamara Claims Record For Biggest Wave Ever Surfed". CBS Los Angeles. 2012-05-08. Retrieved 2012-08-22. ^ "Largest wave surfed (unlimited) - male". Guinness World Records. Retrieved 2018-10-08. ^ "80 foot monster wave gives brazilian surfer world record, judges say". Fox News. 2018-04-30. Retrieved 2018-05-01. ^ "See Why The Biggest Wave Ever Surfed Is Not All It Seems". Forbes. 2018-08-18. Retrieved 2018-10-08. ^ "Wave 35m Big Mama". Surfer Today. 2018-01-19. ^ "Portugal drowning: British girl Lara Lewis and grandfather Brian O'Dwyer swept away in rough seas during holiday in Nazare | Mail Online". Dailymail.co.uk. 2012-02-29. Retrieved 2012-08-22. ^ "The economic power of surf". The Business Report. Retrieved 24 January 2019. 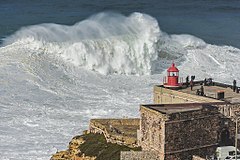 Wikimedia Commons has media related to Nazaré.